Reinventing or restyling a piece of furniture is a great way to inexpensively get a whole new look.The photo below shows how a humble cupboard, in a style we often see here in New Zealand, can be re invented by putting some funky fun colours, and more modern accessories around it. Most of us would be inclined to paint the cupboard or change it somehow, but here it is shown that there is no need. Just add a modern/retro touch with the cool colours and it seems quite at home. And here is another idea for a dining area. Repaint the chairs and place with a retro/modern styled table. Easily done to reinvent those old chairs that you might be tempted to give away! 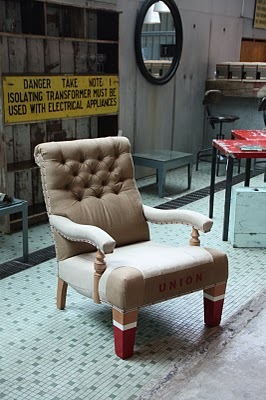 Below is a chair reupholstered in a funky pink, and yet it works with all the more up to date things around it. Nothing expensive or trendy here, just great styling. Below is an update on another chair- having a de-constructed look is quite a trend at the moment as is adding an industrial edge to more traditional pieces. The Boiler Room does a fabulous job or reinventing some of our more colonial heritage pieces. Gary and Sue have a great talent for finding the ordinary and reinventing it in a whole new way whether it be industrial or contemporary. Very clever and talented. Check out their website and visit their shop in New North Road. Perhaps in our consumer, fast moving society we all just need to stop, take a breath, and think about how we can re invent a piece of Nana’s furniture so that it becomes an item of beauty. Up-cycling, no more landfill required. What do you think? Check out our Pinterest board for more inspirational furniture re-invention ideas.